Failed: Another one leaves the test pit to sit out the night in the holding yard. There’s something going horribly wrong in the trucking industry. 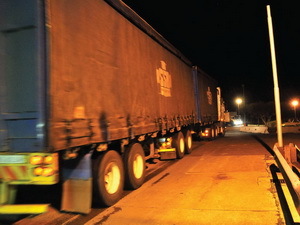 Out of 24 trucks tested at the Midway test centre alongside the N3 during our last Brake & Tyre Watch exercise , conducted during the night – no less than 20 trucks were served with Discontinuation of Service notices. That’s an 84% failure rate which surely is enough to tell us we have a serious crisis on our hands writes Patrick O’Leary. I could not believe it when, comethe early hours of the morning on December 9th last year , at around 01h00 or so – I walked alone into the holding yard alongside the Midway test centre and found it almost full. Already 20 trucks had been taken off the road for being unroadworthy , mainly braking faults – and if we carried on throughout the night, more would follow for certain. The problem was, there wasn’t much parking space left. milling around , some on their cell phones calling their depots to inform them they would not be arriving on time; or trying to wake the owners who were no doubt tucked safely into their beds while these guys were plying the roads steering potential death traps along the N3. Back inside the test centre, the various experts from our partner companies were still hard at it, going through the rigs as they trained the cops. It had been a long day starting at eight that morning with the theoretical training of some 40 or so traffic officials in the conference centre of the magnificent Blue Haze Country Lodge just outside of Estcourt. We then moved to the Midway test centre and started the practical training at 6.30pm going right through until now , around 1.00am. If only all transport operators could be as dedicated and passionate about ‘˜Best Practice’ as are our partners in this venture. If only’¦..
Surveying the sorry scene in the holding yard, I felt a sadness come over me. For many years I have defended this industry against its many critics. But how do you defend this? After seeing numerous faults throughout the night , most so easily avoidable if simple, routine maintenance was conducted by operators – I had just left talking to a driver whose truck was found to be horribly overloaded. He had circled and was now waiting in line to go over the test pit. He was a small, gentle man who told me he had been called in by his boss as a back-up driver due to something or other being wrong with the previous guy’s truck tractor. 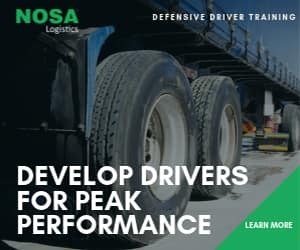 He said that after driving a few kilometres, he felt the rig was sluggish and he called the boss to say he thought the trailers were overloaded. He was told to just drive it and to get to the customer on time the next morning. That poor guy was now about to spend the night in jail , through no fault of his own. He was about to get a criminal record , through no fault of his own. How can you defend all this? The answer is, you can’t , and we don’t. We condemn the situation just as the cops condemned all 20 of the trucks that were found to be unroadworthy. There are some people who have commented in the past that we probably only take the worst rigs off the road for testing in these Brake & Tyre Watch exercises and by so doing, exaggerate the true situation on the roads. In fact, elsewhere in this edition, in an article headed Insurance Views and Woes, one of the insurers is quoted as saying he was surprised that 84% of the rigs failed. The fact is – we don’t take only the ‘˜worst’ trucks off the roads for testing. The cops go out and randomly select passing trucks , and some of them belong to companies with very familiar names. But don’t let me try convince you of this! Let’s get some ‘˜outside’ opinion. For this exercise, we brought in three new partners to expose them to what we normally find , and to have them pass on their expertise to the cops, which is such a vital component of every Brake & Tyre Watch project. Apart from our stalwart and much valued partners, Wabco, Bridgestone and HCV, as well as, in this case, the N3TC which supports our exercise every time we hold it on the N3 (three cheers to all of them! ), joining us for the first time were Mercedes-Benz South Africa, JOST and Gabriel, a division of Control Instruments Automotive. And they were all surprised by what they saw. Brian Kerr, driver training manager for Mercedes-Benz South Africa who earlier that day had taken the cops through a tractor showing them the safety features and technology incorporated in today’s modern trucks, said it was a total eye opener for him how many guys take a chance on the road. “I was shocked,’ he said, “especially at the condition of the trailers. I could not believe how many operators are stilldoing the ‘˜back-yard’ repair thing; how unprofessional they are and to what lengths they will go to save money on maintenance. And some of them are well known names. spotted are highlighted and commented on elsewhere in this feature. The same echoes of shock came from Gabriel as well as from the SA Roads Foundation , although less so from the latter as they had been with us at Limpopo. 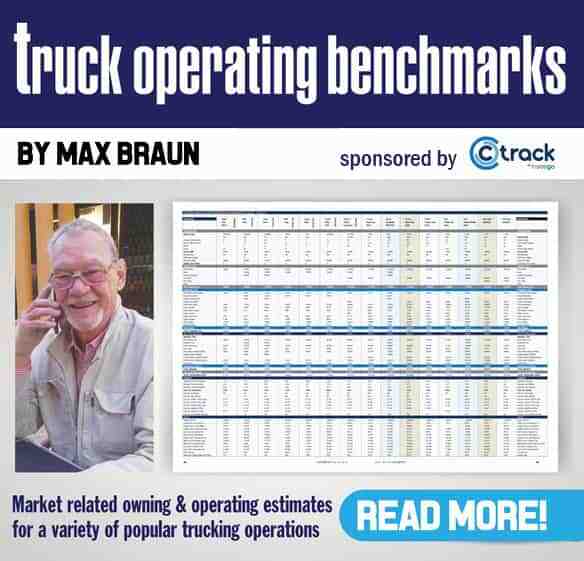 As for our traditional partners, Wabco, Bridgestone and HCV , as well as the ever enthusiastic and knowledgeable Wolfgang Lehmann , there’s not much that surprises them anymore for they have seen worse in past exercises. The N3TC’s Con Roux and Gideon Cloete, although having been with us before, still find it hard to believe how operators canrun their trucks on public roads in the shocking condition we find them. What stands out as prominent for me is that things seem to be getting worse, not better, out on the roads. For 20 out of 24 trucks to be suspended in the short space of five and a half hours is totally unacceptable. It’s a disgrace to the industry and we all know that the companies which are doing things right will be thrown into the same basket as those who are not. The good name of the entire industry gets tarnished by those who will take chances with people’s lives for the sake of saving a few pennies. And here’s proof that their actions do have dire consequences. According to figures FleetWatch got from the N3TC, the number of crashes along the route increased from 48 in December 2009 to 55 in December 2010 – an increase of 14.6%. The number of injury crashes increased from 21 in December 2009 to 28 in December 2010, an increase of 33.3%. Please will those operators whose trucks were suspended work this out? How much money was wasted by your trucks spending the night going nowhere? You might have saved pennies by skimping on maintenance but this cost you many thousands of Rand in forced downtime , and no doubt some unhappy customers. When Wolfgang Lehmann and I visited the yard at around 11.30 the next morning, many trucks were still parked. They had already lost a night and half the day’s production. Show much have you saved Mr Truck Operator. You work it out and tell us the logic! And think of this! If you continue along your shoddy road, it’s going to cost you more because we left behind 40 well-trained cops who will be looking for unroadworthy features on your trucks which many wouldn’t have noticed before as they didn’t know of them before. And they are going to take those trucks off the road again , and again , and again until one day, one of them really gets really peeved off and calls on the MEC to implement Section 50 of the Road Traffic Act and suspend your operator’s license. Instead of paying the minimal cost for a 6mm round bar to be used as a down rod, this customer would rather tie the load sensing valve arm out of the way. This causes insufficient brakes for the laden condition and flat spotted tyres in the unladen condition. There is just so much to show and tell but in this edition, I have decided to concentrate on highlighting the common faults found via pictures with short comments from our experts. Please, please, please Mr Operator. Have a look at the photographs. Call your workshop manager and diesel mechanics together and discuss these faults with them to ensure they are not occurring on your rigs. This customer bypasses the trailer brake valve as the R265 cost for a new WABCO park brake valve is too expensive. Thank you to our partners for making a difference. And thank you too to those traffic officers who worked late into the night with unstinting enthusiasm. You were stars! And now, Mr Operator, it’s up to you. Will you please also make a difference.